^ I usually come out thinking that there are. 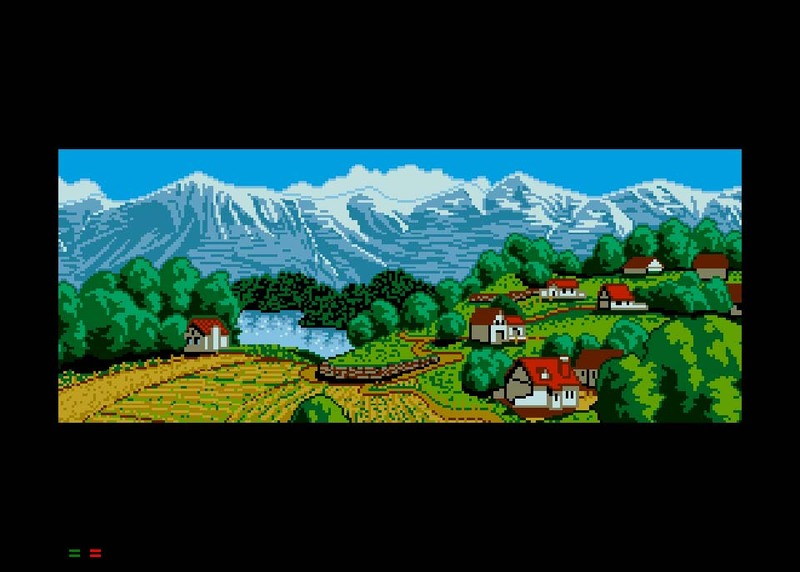 This is more necessary for some worlds than others; Chrono Trigger would have a very sparsely populated world if the cities we saw were the *only* cities. I also think that whether the cities are there or not is kind of irrelevant. (If fun to speculate.) It's not like they're (ordinarily) trying to create a copy of a world that could actually exist. Rather like a play, it creates enough of the world and gives enough characters to move the story forward. At best, it works on the illusion of space to allow players to fill the gaps in the world with their own imagination. I could imagine there being a lot of other places in Lunar I've never seen, but their existence or nonexistence does not matter to the story. The Blue Spire could be unincluded, on it could be in an unseen part of the map, it could not show up on a map emphasizing some key landmarks over others, or it could be obscured by a geographical feature; none of these reasons are defensible. 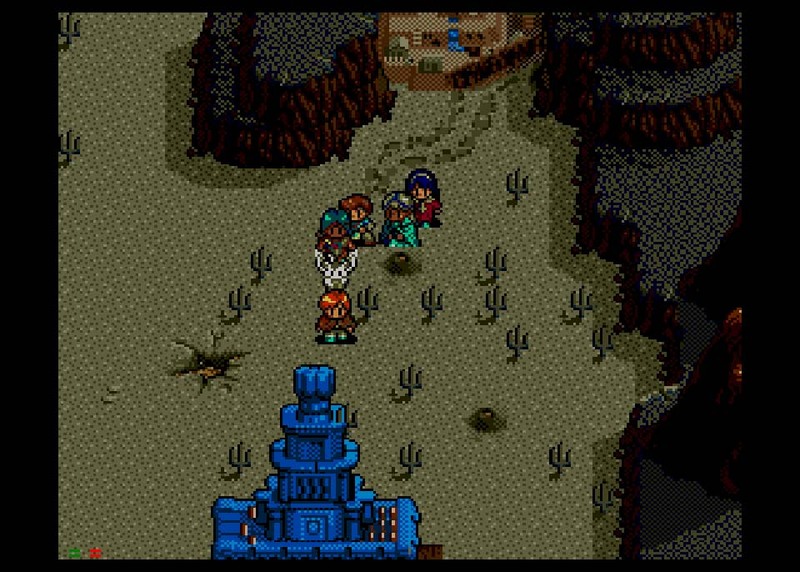 The absence of the Blue Spire in Silver Star happens first because the first game was designed without the plot involving the Blue Spire in mind. The effort of including it as a point on the map in later releases might be for Arlia's mention - lots of effort for little reward. 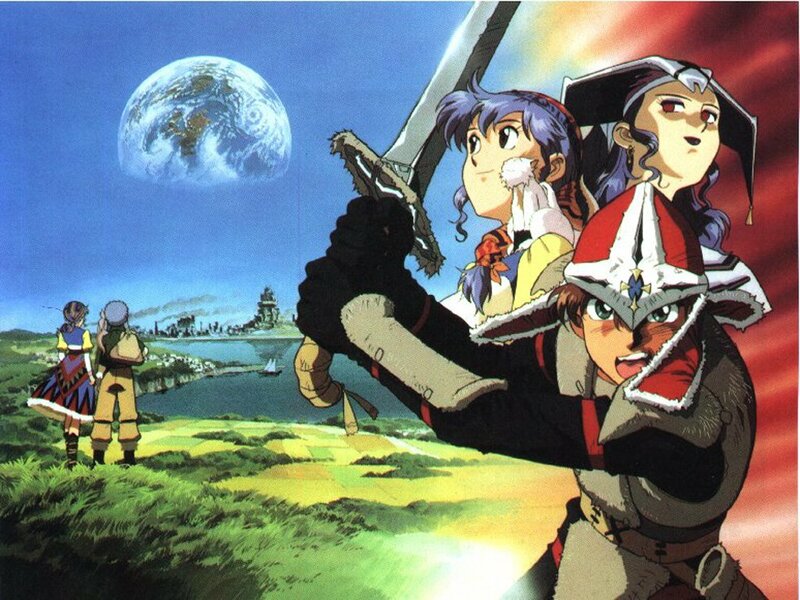 Why include a dungeon when the possible release of an Eternal Blue remake has always been tenuous at best? As far as putting the Blue Spire in a version of L1, I agree that it would be totally pointless. Either you'd be able to get in -- which would be kind of a mockery of the whole opening of EB, what with the dragon eyes and all -- or you wouldn't, which would just tantalize and irritate the players. I was just thinking last night about how annoying it is to see Black Rose St. in EB's Meribia map and not be able to GO there. Likewise with the towers in Vane. One could also make a case that during L1 Althena's power in some way hid the Blue Spire, Star Dragon Tower, and Dragon Ruins, as a security measure (people weren't supposed to be able to go to the Blue Star yet), and that after her retirement that protection faded. 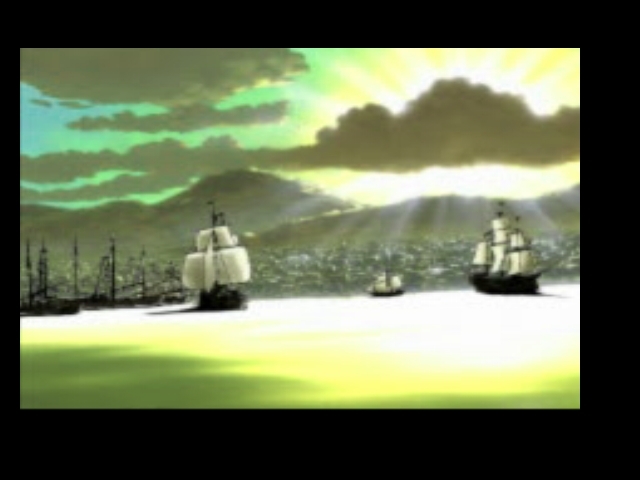 It would not have done for some petty thief pretending to be an archaeologist to make off with all of the Dragon Eyes centuries in advance... Of course, the Vheen manga contradicts this since it shows a young Ghaleon with the Blue Spire in the background. Okay guys, I know that this thread was made in 2010, but it always interested me and now I finally made a map! Let's take Meribia as the center, since it's located in the only area of Lunar that is present in both games. As we can see, in the SSS map, there's a desert to the right under some clouds. That's the desert you cross to get to the frontier. Anyways, it seems that desert is really huge and empty in SSS, but it seems that somewhere in there is where the Blue Spire would be. So there. According to my research, the Blue Spire is IN BETWEEN the Frontier and the Stadius zone, where the Black Dragon is. It makes sense that Alex never found it! Being the big desert it is, it would have required exploring the desert, but they had no time to do it. There's also that ruin where Hiro starts his adventure. It should be somewhere in there too. I can't remember the in-game map very much at this moment. Another thing that shocks me is Pentagulia. Never realized it's placed EXACTLY where Althena's palace was when you meet Phacia! There's just a big hole there in EB and EBC. Really freaking accurate considering that one of the maps is artwork from TSS (Sega CD) and the other is in-game from EBC (PS1). 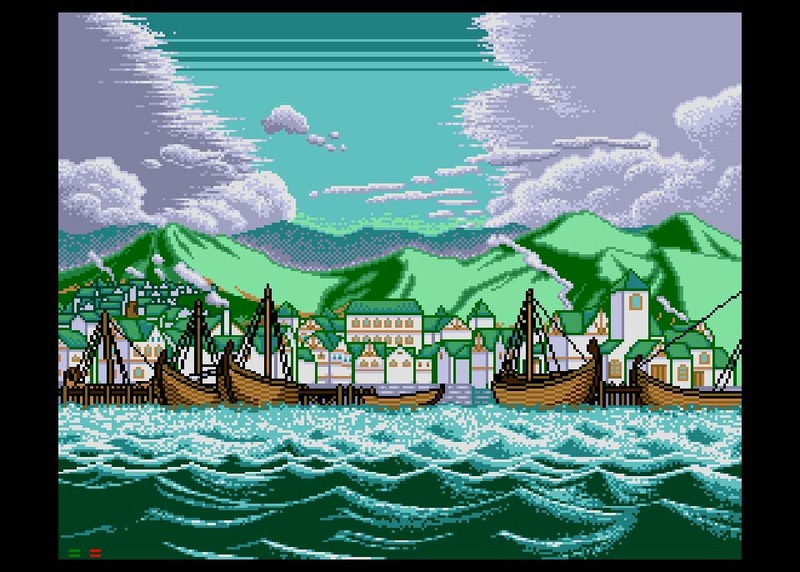 Sega CD's EB is responsible of many things that appeared in SSS. The way SSS map is in the game just seems to follow EB's style. Could SSS be a mix of being TSS remade, and a sequel to EB? Could SSS be half the Lunar 3 everyone had waited for? Another thing I see in the map is Caldor Isle. 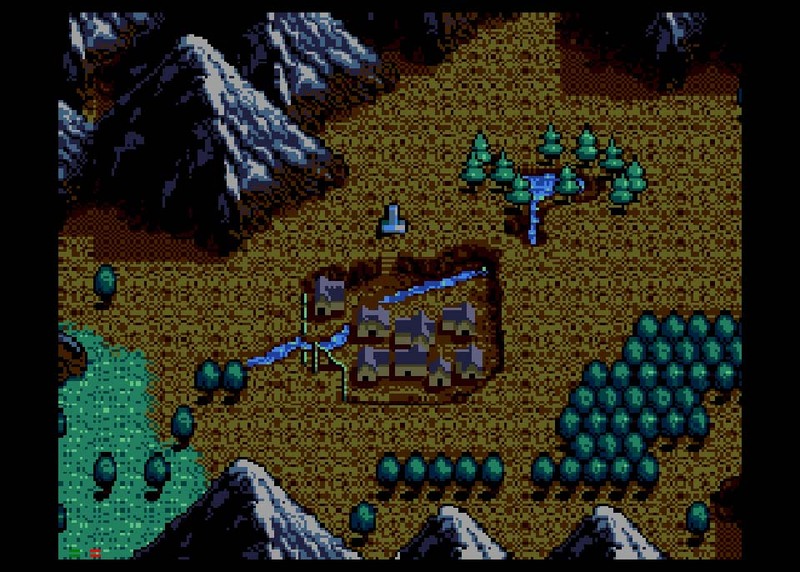 It would appear as if EB's frozen island is it, but if you travel there, at least in the Sega CD, it's called "Katarina West". ...unless it was brought closer in development for convenience... or driven farther away as a whole new iceland appeared there. Or maybe EB isnt 600 or 1000 years after Lunar 1, but 2000 years or more! Keep in mind that you're comparing the TSS map to the EB one, so using screenshots from SSSC won't work. TSS's map and SSSC's were too different regarding the Frontier and the Grindery to mix and match them. The TSS Grindery at first only moves a short distance from the Talon Mine, as the screenshot shows; something happens, I forget what (the shot at Vane? 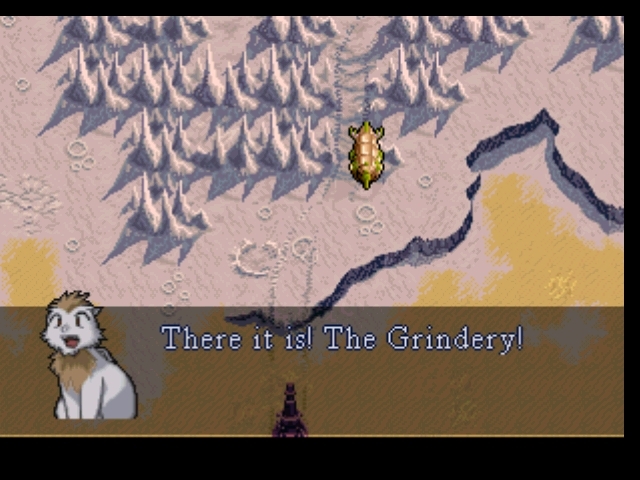 ), but the party eventually loses track of the Grindery (the tracks fade out). It next shows up near Meribia -- no idea how it crosses the mountains to get there. This is part of why I always considered it to be Taben's Peak in EB, and I think this was more or less spelled out in EBC when you first see it, with the treads showing under the overgrowth and stuff. And yeah, no kidding that Pentagulia is approximately where the Goddess Tower was -- after all, it still contains the Tower. I've generally considered EB's map to be rotated a bit relative to TSS's -- compare Meribia's orientation relative to the coastline. Headache? Don't mind the map too much there's nothing in common besides Meribia and Vane. You say that you consider Taben's peak MIGHT be something else other than the Grindery? What i'm currently interested in seeing now is an in-game map of TSS! I think I have one somewhere. I'd like to compare that to all the other maps. How in the WORLD did the Grindery shoot at such a far distance in TSS??? Vane was just having a nice day and then a laser comes straight at it from beyond the horizon. Believe me, the presence or absence of the OP is not much of a factor in whether the thread is of interest. It's been ages since we've had a theory of Lunar thread. No, I never considered Taben's Peak to not be the Grindery, but I'm sure I've seen posts by people who didn't think of it or were skeptical. It wasn't as obvious in the original EB, I think. And, of course, people who played EB first might not see the connection immediately. I also think the Mystic Ruins are Taben's Tower in Ruid, but that's less obvious. I remember arguing about it here at some point. Again, might have been more likely with the TSS version of Taben's Tower than the SSSC one. Somewhat less defensible was my theory that the Sunken Tower in EB's epilogue started out as the Saith Lighthouse, but since both of those were removed from the remakes there's even less to go on with that. It seems to me that I had a TSS screenshot map somewhere but it's not on this computer. I'll try to remember to look for it. There's a black and white one in the TSS strategy guide, but you'd have to really squish it to scan it. And, well, the power to shoot down Vane came directly from Althena. "Goddess Althena, heed my command... and decimate all who stand before me!" I forget all the words, but that scene is one of the only ones you see Althena in in that game. Hey, that's neat! I never would've thought of comparing the two. Speaking of maps, I find it sad that EBC's in-box map is so frail. But having said that, both of them are pretty worthless gameplay-wise . Never once did I wonder where I was, or where I was supposed to go. There's no where to get lost, and it gives you concrete instructions where to go. Don't get me wrong; I very much enjoy having a piece of the lore, and a box full of cool items to show for buying the game, but it's a valid observation. Yeah, I think the maps mainly just serve to give an idea of scale and geography. It never occurred to me to actually use them for anything -- perhaps because while it's entirely possible to get lost in TSS (I spent hours looking for stupid Reza once, and this wasn't even my first playthrough), the map is, as you note, pretty worthless for that. 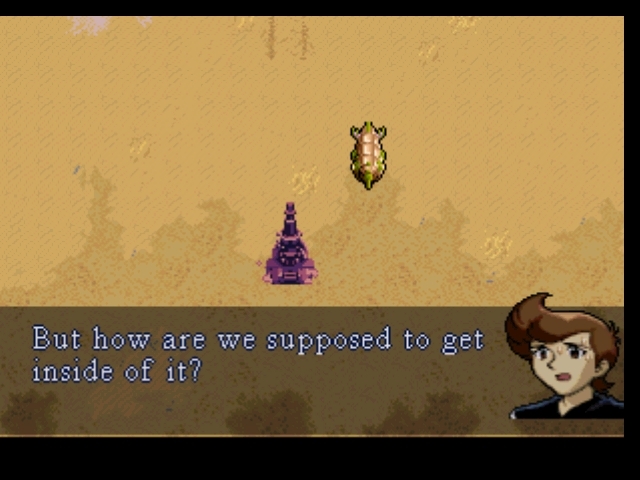 Alunissage wrote: less defensible was my theory that the Sunken Tower in EB's epilogue started out as the Saith Lighthouse, but since both of those were removed from the remakes there's even less to go on with that. Ha! Alun, I knew we were always on the same page. That had been a pet theory of mine in pre-EB remake days myself, at least if we assume that the White Dragon's Cave is geographically tied to Burg. In terms of being in the north, and of the frozen nature of the cave in TSS/SSS, it works---maybe the climate changed, or maybe Nall froze the whole area in memory after it all vanished. When I was young and stupid, I hypothesized briefly that the EB mystic ruins were actually the remains of Ghaleon's Mechanical Castle. Architecturally, this did not hold up. Far more importantly, the names made the connection clear that Nall's EB hideout is the old castle, what with it being the Mechanical Mountain, straight after the Mechanical Castle. Unmissable in Japanese...and I suppose the Taben connection in the US version is fairly clear-cut, if not to people who didn't play TSS/SSS. Bonus fun for architecture: I feel as though I recall the architecture of Nall's throne room in EB looking like the room in TSS's Mechanical Castle where you fight the fire monsters in the furnace. I always assumed Hiero was more or less living in the Frontier, which seemed fitting enough, though maybe it's a bit closer to the TSS mainland, as mentioned above.